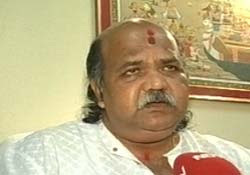 Bhubaneshwar: Under mounting attack following sexual abuse charges levelled against him by a woman Assembly employee, Orissa Speaker Maheswar Mohanty resigned on Monday even as a key minister was sacked for allegedly instigating the woman to hurl the allegation. The Speaker, against whom a case of sexual harassment has been registered following an FIR lodged with police by lady Assistant Marshal Gayatri Panda, gave his resignation to Deputy Speaker Prahallad Dora, official sources said. In a related development, Chief Minister Naveen Patnaik dismissed Information and Public Relations Minister Debashish Naik who had allegedly instigated Gayatri to hurl the charge against Mohanty. The Speaker had said that the charge against him was part of a conspiracy in which influential people were involved. The criminal case against Mohanty was registered on March 29, two days after the lady assembly employee lodged an FIR through a group of women activists accusing him of sexually harassing her. Soon after reports about charges levelled by Panda appeared in the media on March 26, opposition parties mounted a campaign demanding Mohanty's resignation and a thorough and independent probe either by a High Court judge or by CBI. The proposal given by the government and the Speaker of a probe by a House committee was rejected by a determined opposition, which also paralysed the assembly since last week. Mohanty said on Monday that he wanted a unanimous decision of the assembly but unanimity was not possible and ''I resigned to protect the office of the Speaker''.